LIMITED EDITiON: The Icetool Slim Can Leatherface is a pocket-sized Icetool Slim Can for portion snus, made of strong and light aluminium with brown leather accent embedded in the lid. Due to its format, Icetool's "Slim Can" does not have a used snuscompartment lid. 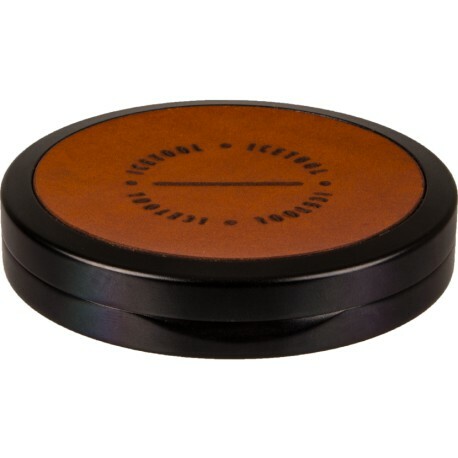 LIMITED EDITiON: Black, pocket-sized Icetool Slim Can for portion snus, made of strong and light aluminium; this one with with brown leather accent embedded in the lid. Due to its format, Icetool's "Slim Can" does not have a used snus compartment lid. The idea of a slim & reusable snus tin had piqued my interest lately, and I'm a big fan of leather, so I threw this tin into my recent order. It ended up being well worth the price. If you’re a regular snus user and are looking for an expertly-built slim snus tin, look no further. The entire aluminum assembly is perfect, with no sharp edges, and a gentle chamfer on the top and bottom rims. The silicone gasket that keeps the lid closed offers the perfect amount of resistance to allow for easy opening, but also keeps it closed when need be. In its closed form, it’s a perfectly smooth aluminum sliver of snus, that is approximately the same circumference of a standard can, but at half the height. I only had a little trouble getting a full can of 24 slim portions into the tin — General’s famous “star formation” helps a lot here. Either way, a full can fits! It just may take a minute or two of careful placement. The decorative leather attachment seems to be of the same high quality. Sourced from Swedish leatherworkers Tärnsjö Garveri, it looks and feels to be a top grain leather (pretty good!) I was not expecting that, and while it’s been pre-tanned in the manufacturing process, I’m still looking forward to how it ages.